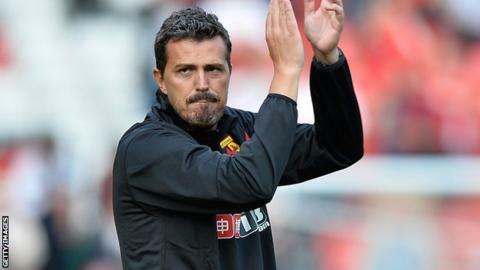 New Watford boss Oscar Garcia has been admitted to hospital with minor chest pains and will not attend Tuesday's Championship game at Blackpool. The 41-year-old Spaniard spent Sunday night in hospital and will underwent further tests on Monday. He took charge of his first Hornets game on Saturday and saw his side lose 1-0 at Charlton. "He's been in contact with the coaching staff," sporting director Luke Dowling told BBC Three Counties Radio. "He still wants to play his part in preparing the team for the Blackpool game. "Oscar was up in bed having breakfast on Monday. If the advice is don't rush him back for Saturday, then we won't. And obviously Oscar has got to feel alright in himself." Assistant coaches Ruben Martinez and Javier Pereira will take charge of the side at Bloomfield Road. The former Brighton boss took over at Vicarage Road two weeks ago and the defeat by the Addicks ended a run of three successive league wins.